Trident Z is G.SKILLs premium memory module series that has been created for enthusiast overclockers to get the best possible results from the memory performance, as highlighted previously. This is done by cherry picking memory ICs and fitting them to a custom made 10 layer PCB for maximum signal stability, reliability, and compatibility. The XMP settings has been optimised for Intel processors, though, there is no reason why they won't work fine on other platforms. 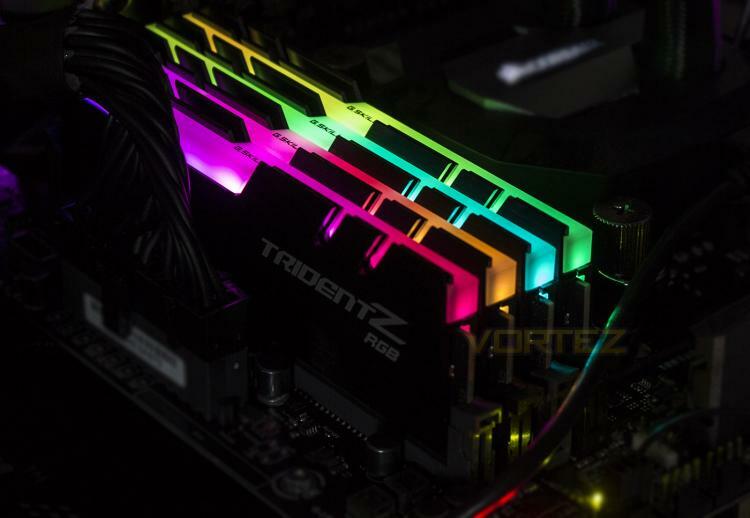 The Trident Z RGB memory modules have, of course, been upgraded with a fluid, full range RGB LED bar that is supported both by ASUS Aura Sync, and by their own software so users can get the customisation they need to fit their system and preference. G.SKILL has made the Trident Z RGB available in huge selection of capacities, frequencies and timings, Ranging from 2x 8GB Dual-Channel kits, to 8x 16GB 2x Quad-Channel kits for HEDT platforms.